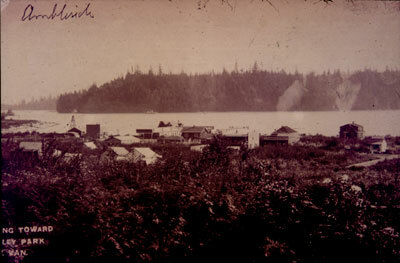 View looking towards Burrard Inlet and Stanley Park of early Ambleside development and businesses. Scanned December 2011 using Epson Perfection V700 Photo at 300dpi and 100% of original image size. Alternate Versions: Lossless TIF from original scan at 300dpi and 100% of original print. W18 x H12 cm sepia print on photo paper.